I’m separating my Year In Review post into Writing and Personal this year. I had too much to think about, and just couldn’t combine them. So, If you’re interested in my 2012 Personal Perspective, click the link to go see it. So, my 2012 Writing Perspective? NaNoWriMo is over. Sorry about not posting anything during the month. I wanted to, but NaNo writing consumed me. First things first, I won. But, I’m not done with this story by a long shot. I think I’m halfway though, if I’m lucky. I plan on finishing the current section of the story, and then going back to the drawing board. I like where it’s going, but I need some better focus. Now that I know what the start of the story is, I want to get it plotted out better. I will say, that in these last 3 days since NaNo finished, I feel relieved. But there is a bit of a letdown. It’s like a NaNo-blues, I guess. I know what I’m working on next, so that’s good. I just need to get working on it now. So, on my docket for blog posts. A review of the new DestinyQuest book, The Heart of Fire, now that I have time to read/play through it. I also wanted to talk about tablet computers and their ilk, so watch for that one. Over at Hero’s Tale I am waiting for some input for the next part. Please go read Part 12, and leave some thoughts! In the meantime, I’ve got work to do, and a chapter from NaNo to finish before I start on the next parts. Time to put my nose to the keyboard. November is upon us. That is the month my wife loves, because I’m not in her hair bugging her. Either that, or she hates because she becomes a single parent. Why? One word. 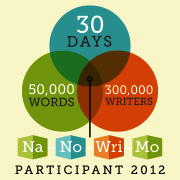 NaNoWriMo. And you’re right, it’s not a word. It’s four. National Novel Writing Month. And it’s exactly how it sounds. Write a novel in a month. Or to be more specific, 50,000 words. It’s a fun challenge, and I’m undertaking it again. I plan on posting updates as I go, and maybe some snippets of what I’m writing. I’m also going to include a widget on the sidebar to show how many words I’ve written. I like to keep that up to date, so if you visit, you’ll see where I’m at. Or, you can go to my profile page and see some info there. I keep that one pretty basic, though. So, what I’m I writing? This year is a rewrite. Again. Two years ago, I did a rewrite of a project, and I’m rewriting that one. I’m not happy with the direction the story went, and it needs reworked. So, that’s what I’m doing. The working title is Hero’s Tale Book 1. And yes, it does relate to my Vote Your Adventure story. But, I’m not going to say how at the moment. I plan on talking more soon. After all, you need to know how to make your own pumpkin spice coffee, right? I’ve talked about the #MyWANA Twitter community before over at my Hero’s Tale blog. But let me give you a quick refresher: WANA stands for We Are Not Alone. Writing is an extremely solitary practice. So, to have somewhere to gather on-line like this is important. And a lot of fun. See founder Kristen Lamb’s blog entry, or my link above if you want more info. As I’ve participated in the community, something became quickly apparent. The vast majority is female. Now, I don’t know if this is an indication that there are more female writers, or just more females involved. It did make me wonder something about this group. So on August 23, I asked this question 3 times during the day: How many of you were at home during the day (with kids or not) and how many worked and did writing afterwords. Now this was an idle curiosity, not a scientific survey. Please don’t take my results as anything more than some interesting results. All the gals who are at home are at home with kids. Plus, all those who work part-time have kids. I shouldn’t say I’m surprised, but I didn’t think I’d see something that extreme. I thought there might be one or two that had no kids at home. That could be explained by the sample size, though. To extrapolate a little, the vast majority of the women on #MyWANA are at home in some fashion (home full-time, work from home, or part-time). I suspected that might be the case, but didn’t quite expect so much variance. I work. I was a stay-at-home, but I get more writing done now that I’m working again. I thought about that, and I completely understand. I thought about my wife at home with our 3 kids. There are days that she gets more done after the kids are in bed than during the rest of the day. I know I do. During NaNoWriMo, I get most of my writing done during the week in the evenings. Weekends are all but useless to me for writing. Truthfully, other than some fun stats, I really don’t know what you should take from all this. So I’ll leave you with this. The #MyWANA tribe is a great place to hang out. Everyone is friendly and willing to help. Whether you are a stay-at-home mom/dad or work for any amount of time. Everyone is welcome. See you there!